Custom Tent Desk Calendars Personalized in Bulk. Promotional, Cheapest in America. Scenic, Cars, Pets, Inspirations. Custom Tent Desk Calendars Personalized in Bulk. Promotional, Inexpensive, Budget Prices in USA and Canada. 12 photos, Spiral bound. American Landmarks, American Nature, Pets, Christian, Inspirations, Flowers, Golf, Muscle Cars, World Travel, Lighthouses, etc. Bulk promotional desk calendars, easel/tent style, with 12 high resolution pictures, color cover, custom imprint on both sides and very fast delivery: 5 days production. 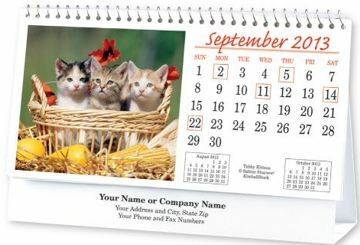 Our custom imprinted wholesale desk calendars are ideal for mailings. Free custom imprint on both sides! 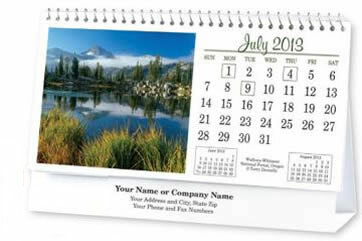 Lowest prices in the USA and Canada for wholesale personalized desk calendars. American clients pay no taxes. Unit prices below include one color imprint in Black on both sides! Please add a fee of $18.00 per order for imprint in a different color. Black and White Photos in the imprint: add $40.00 per order. Custom Imprinted Envelopes: $0.20 each. Setup Charges: $20.00per imprint color on both sides; Additional Imprint colors: add $0.20 per imprint color, per desk calendar. Estimated Production: 5 working days after artwork approval. Product Size: 6-1/4" x 4"
Imprint Area: 5-3/4" x 5/8" ; 4 lines, on both sides! Imprint Colors: Black, Blue, Green, Red; Add $30.00 for a different, specific PMS color. Models of bulk desk calendars: please click on the Titles below for pictures of months. American Landmarks Desk Calendar (featured)- Tent Calendar with 12 famous American landmarks. American Scenes Calendar (featured)- Tent Calendar with 12 American nature scenes. Christian Reflections Tent Calendar - 12 beautiful nature photos with Bible Quotes. World Travel Desk Calendar - 12 world landmarks photos. Lighthouses Tent Calendar 12 American Lighthouses photos. Murphy's Law Tent Calendar 12 hilarious cartoons. Muscle Cars Desk Calendar 12 pictures of American muscle cars . Item #: DA1 - and add type under "Special Instructions"